In footballing terms, there can be no better way to celebrate the Queen’s Birthday than to party on down with her in the game which celebrates her special day – the Queen’s Birthday clash between traditional rivals Collingwood and Melbourne. It is one of the biggest matches on the AFL calendar and a day for the greats to shine – which is exactly what American Mason Cox did today. In a performance that earned him the trophy for best afield, the Neale Daniher Trophy, Cox joined other past stars such as Scott Pendlebury, Dane Swan, Max Gawn, Aaron Davey and Travis Cloke in receiving the honour. There was nothing “average” about Cox today – he proved emphatically that his days as a novelty player are done – replaced by a footballer who seriously can play the game and is getting better each outing. He will be best remembered for his five-goal effort (and one behind) across the four quarters today. Not only did he take towering pack marks, he also brought smaller players into contests. Seemingly unsatisfied with his two metre plus height, Cox was also content hurling himself a few extra metres into the air, hoping to add a big “hanger” to his expanding repertoire of skills. Cox had his first goal, and the first of the game, inside of two minutes into the first quarter. He kicked his second mid-way through the quarter. By three-quarter time, he had four goals and added another early in the last. 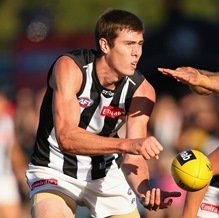 He didn’t score again, but by then the damage was done and Collingwood were more than five goals in front. His efforts up forward were enormous for Collingwood and directly helped set up the win – which they duly did, downing the Demons 20 13 133 to 14 7 91. However, there was much more to his game than the scoreboard. He totalled 16 possessions for the match (twelve kicks and four handpasses) of which an impressive nine were contested possessions. Not only did he hit the scoreboard six times, he also added three inside 50’s to his stats and nine hit-outs when he was giving Brodie Grundy a rest. Throw in a tackle and a couple of one percenters (the important little team acts) and this match may have been his most complete playing performance yet. It certainly wasn’t his five goals that earned him the trophy – it was his involvement across all aspects of the game which impressed. The native of Dallas, Texas, has worked very hard to chase a dream and succeed at AFL level. In the process, he has inspired footballers from across the world to share a similar dream. He has proved that hard work rather than luck is the real measure of how far a player can go – along with a liberal dose of talent. To achieve what he did today in the Queen’s Birthday match in front of more than 83,000 fans at the MCG makes his game even more impressive. In fact, Cox is making something of a big occasion player of himself. After two Queen’s Birthday and three ANZAC Day matches over the past three season’s he has kicked an impressive ten goals six behinds. But, of all of his games, today’s effort was truly a royal command performance.